My dress black cap toe J&M shoes recently went in for a resole, but before I did it, I started to think about replacing them with a pair of boots of similar style. Thursday has their Captain which looks perfect for what I want: 6 inch shaft, dress profile, speed hooks, dainite sole, cap toe. The reviews seem fair to middling on the quality though. I have a pair of Red Wing blacksmiths that I've worn since July of 2015 and they just keep looking better. I'd like to find something with similar quality that will last and look great for years. I think the Captains could work, though their QC seems hit or miss. Though the Captains are $200, I don't mind spending $300 or so for the right pair. Any other suggestions? Have you considered the AE Higgins Mill? I'm not sure they are still on sale but they had some nice prices on them last week. Wolverine does a cap to boot as well and seem to fit the rest of your requirements. I love my pair and probably wear those more than the Alden 403s or the daltons that I own. Last edited by Useknifeonly; December 1st, 2018 at 11:34 AM. The cap-toe version is Normandy, and they are on sale for $276 right now. But no speed hooks. FWIW I would just clarify that the Normandy is not a cap-toe “version” of the Higgins Mill - they are two totally different boots. I often ride a motorcycle to work so I need something that covers my ankle, so Chukkas are out. 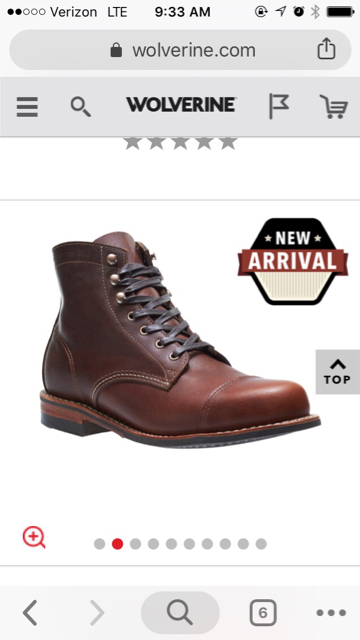 Wolverine 1k mile boots were supposed to be at the Needless Markup near me, but apparently they lied and only carry them online. Lame. There was an Allen Edmonds store in the same mall, so I checked out the Higgins Mill. They look too much like the Blacksmiths I already own, at least from an upper standpoint. The Sullivan Street looked perfect, but I didn't like the contrasting pebbled leather. The Daltons were a little too in my face for a boot, and no speed hooks. I like the Pacer that you picked out. Have you considered a Chelsea boot? Meermin has some up for $240. I bought the Allen Edmonds Surrey cap toe but returned it because it was very bulky, felt like more of a work boot, didn't really look good with chinos/pants. I've heard good things about the Higgins mill boot but don't have any personal experience with them. That's a bummer you had such problems with TBC. It's a shame they are trying to win on price alone. With the quality of other manufacturers like AE starting to slip, the $300 price point would be ripe for their product if it's up to snuff. I'm just not a big fan of how Chelsea boots look, though they do look far more convenient to put on a take off. I agree that the Surrey looks a bit too similar to my Red Wings. Too bulky for business casual.